Mighty heroes must enter Isheim’s frozen caverns to defeat this supernatural menace before the south is trapped in endless winter. In this glacial underground, treacherous ice chasms crumble underfoot. Ghostly creatures, immune to the touch of sword and axe, haunt derelict ruins. The growls of ferocious beasts – capable of swallowing a man whole – can be heard from the cold blue darkness. 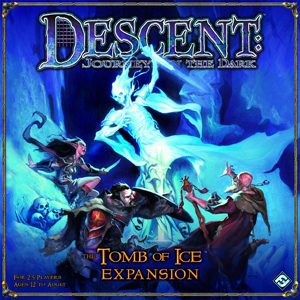 The Tomb of Ice is the fourth expansion for the best-selling board game Descent: Journeys in the Dark. Included are more than two dozen new plastic figures representing spectral shades, volcanic lava beetles, petrifying medusas, stealthy wendigos, and gigantic ice wyrms – not to mention six new heroes. Along with new treasures and a new potion type, The Tomb of Ice provides its heroes with the power of Feat cards. No longer will the element of surprise lie with the overlord alone.